One moment Manhattan Beach native Jim Tucker was shaking hands with U.S. Rep. Gabrielle Giffords at a meet-and-greet outside a Tucson, Arizona supermarket. The next moment, both lay bleeding on the ground. Tucker, a Mira Costa High School graduate, had been third in line to meet Giffords at her Jan. 8 “Congress on Your Corner” event at a Safeway store. He and his wife Doris had just begun speaking with the congresswoman when a gunman unleashed a barrage of bullets from only two or three feet away, striking Giffords in the head, wounding Tucker in the right leg and shoulder, killing six other people, and wounding 11 more. Tucker, 58, a big man, described by friends as a “gentle bear,” would later learn that large bullet fragments had ricocheted into his collarbone, cracking his C2 vertebrae and lodging between two other discs. Smaller fragments had come to rest between his shoulder blades. Still another bullet had entered the lower part of his inner right calf and penetrated up through his muscle before exiting below his knee, missing bones and arteries. Tucker did not feel the bullet that entered his leg. “The bullet to the right collarbone felt like a sledge hammer being at such close range,” he said. The dead on the ground nearby included federal judge John Roll and 9-year-old Christina Green. But Tucker had no idea of the other casualties. He was stunned and had no clue what had hit him. He frantically looked around for Doris and saw her standing above him. She had not been hit. A week after the shooting, Hermosa Beach resident Kent Caldwell sat in his home office, shocked at an email he’d just received from a woman with whom he graduated from Mira Costa in 1970. The email was about Jim Tucker, their former classmate. Caldwell had gone to school with Tucker from elementary through high school in Manhattan Beach and played on baseball, swim and water polo teams with him. 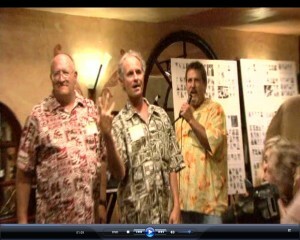 He saw Tucker just last year at their 40th Mira Costa reunion. At a young age, Tucker and Caldwell played on opposing teams in the Manhattan Beach Little League. Caldwell recalled a game in which he was walked to first base. After he took off on the next play, he leaped back to first because the batter was put out and the ball was thrown to second. After high school, Tucker earned a degree in architecture from USC. In 1984, he and Doris, a Wahoo, Nebraska native, moved to Tucson, where Tucker now works as an environmental health and safety inspector at Raytheon Missile Systems, the city’s largest employer. Doris works at the University of Arizona. The couple has no children. Though 500 miles away, Tucker stays in touch with about 20 of his former Costa classmates — a dozen of whom he’s known since his days at Pacific Elementary — through an email chain that Caldwell is also a part of. As Caldwell read the email now before him, he was stunned. His teammate and friend — “the wall” — had been among those wounded in Tucson. A tragedy that had at first seemed far removed suddenly hit close to home. In the tragedy’s aftermath, emails detailing Tucker’s progress and memories from his days as a Mustang started flying around. “We will continue to pray for the healing in [Jim’s] right arm and from the trauma of that horrific scene,” one friend wrote. The outpouring of support from childhood friends did not come as a shock to Tucker. It started off like any other Saturday. It ended in gunfire, national media attention and a visit from the president of the United States. The Tuckers had begun their day by making a mental to-do list that included a visit with their local U.S. representative, a haircut for Jim and — what was to be the highlight of the day — a trip to a home show. “Obviously, we never made it there,” Tucker said, before pausing for just a moment longer than usual. Doris, who works for an astronomy professor at UA, had briefly met “Gabby” during a campaign supporting legislation related to solar energy. Jim had never met Giffords prior to the fateful day. Two days before the shooting, Giffords had introduced a bill that would cut her own salary and that of other Congress members by 5 percent. The Tuckers arrived 30 minutes early to ensure they would be among the first in line. Tucker recalled roughly 30 people lined up under an overhang extending 10 feet from the front of the store. For 10 minutes, they spoke with Gifford’s staff members before she arrived. Only one person was in line ahead of them, and then it was their turn. The Tuckers stepped forward, shook hands with Giffords and started speaking with her. “That’s when all hell broke loose,” Tucker recalled. 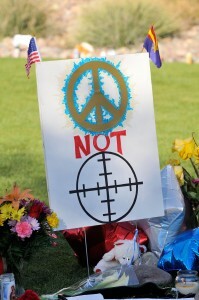 Witnesses said alleged gunman Jared Loughner fired off 15 to 20 shots before being tackled by a bystander. By the time Tucker knew something was wrong, he was already on the ground. He couldn’t see Giffords and had no idea how many others had been hit. Two “good Samaritans” helped Tucker while he waited for emergency responders. One made a tourniquet out of a belt for his leg. The other propped up his head and applied pressure to his collarbone. 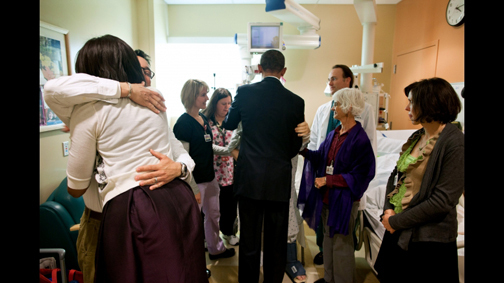 Tucker was transported to University Medical Center in Tucson, where – after a night in the intensive care unit – he was visited by several high-profile government officials, not least among them President and First Lady Obama. Secret service agents waited five minutes outside of Jim’s room while the Obamas greeted the Tuckers, hugging Doris, giving words of encouragement and snapping photos with the whole family. Tucker was also visited by Arizona Gov. Jan Brewer, Arizona senators John McCain and Jon Kyl, and Tucson Mayor Bob Walkup. FBI director Robert Mueller also stopped in to say hello and ask if there was anything he could do. Tucker had been wondering what happened to his belongings, particularly his wallet. Mueller laughed and said he thought he could handle the request — it seemed simple compared to similar requests he often receives, such as women asking him to retrieve a certain shade of lip gloss. Jim Tucker sits in his home — a mere two miles down the street from the Safeway store where he was shot — frustrated by the fact that he can’t move his right arm and can’t yet go back to work. Until his clavicle heals in coming weeks, he won’t have any strength in his right shoulder or upper arm. He has physical therapy sessions three times a week. The Tuckers have received loads of media attention since the shooting. In a statement, the couple thanked the people and public safety agencies that assisted in the aftermath, the Tucson community and friends around the world. Tucker says he doesn’t feel anger toward the gunman. More sadness at the choice he made.